Which of the two sounds "yummm.." to you? 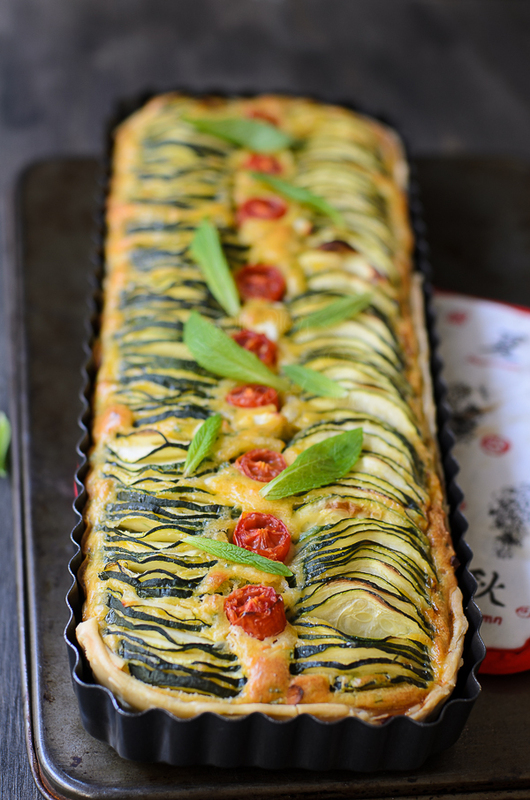 Zucchini/ Courgette belongs to the spesies cucurbita pepo. My teens... however, aren't too keen on having zucchini, steamed or otherwise!! I found Belinda Jefffrey's mini cookbook in a secondhand bookshop, for $2...browsed and had the itch to try her Zucchini, Feta and Dill pie. Surprisingly... not a word from both!!! No complaints!!! ...must have loved the pie as both were asking for second helping :D.
Line a rectangular loose base tart pan with short crust pastry (cut to fit into the pan). Place greaseproof baking paper on the pastry. Blind bake (click here on How to blind bake pastry). In a mixing bowl, sieve plain flour and baking powder twice. Crack eggs in a jug and lightly beat the eggs. Add olive oil and chives. Crumble feta into the egg mixture (reserve some). Add egg mixture into flour mixture and whisk until well combined. Pour the batter into the pre baked pastry pan (to avoid overflowing...do not pour all the mixture into the pan~ use your best judgement). 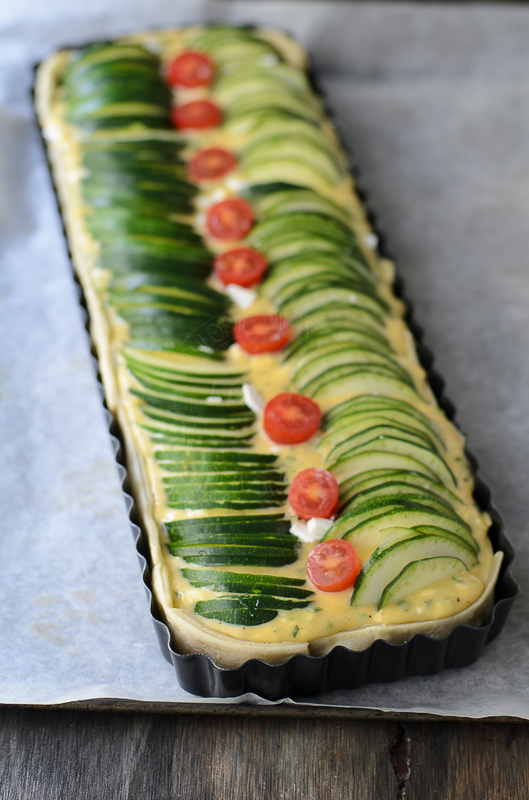 Arrange sliced zucchini, cherry tomatoes and sprinkle feta cheese. Bake for 35 to 40 minutes or until the pie is cooked/ egg-flour mixture is set (skewer comes off clean and fell springy when lightly pressed). Note : * substitute with 100g self raising flour. what a fabulous great pie you have made! Looks really delicious too. Beautiful and so mouthwatering! This is a wonderful pie. Wow Lisa... realy beautiful Pics!!!!! 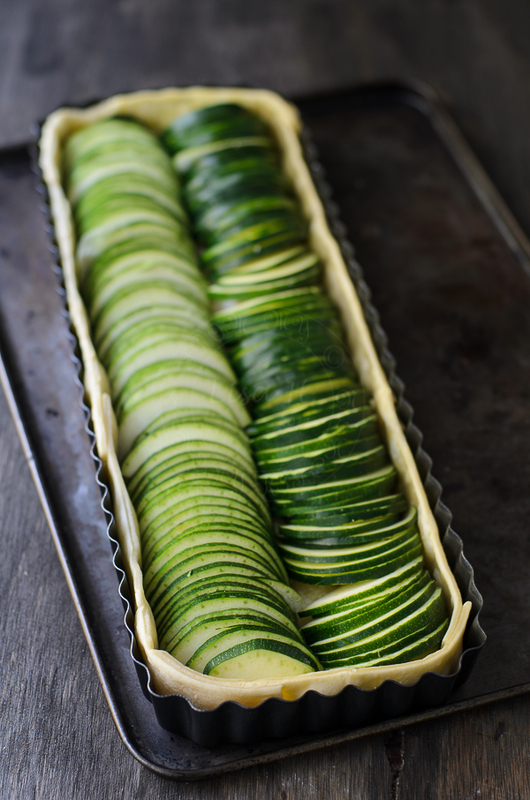 Courgette sounds so lovely, but it will always be zucchini to me. What a great way to incorporate it! Beautiful tart. I made one with eggplant and ricotta earlier this week and it was great. Yours look fabulous. 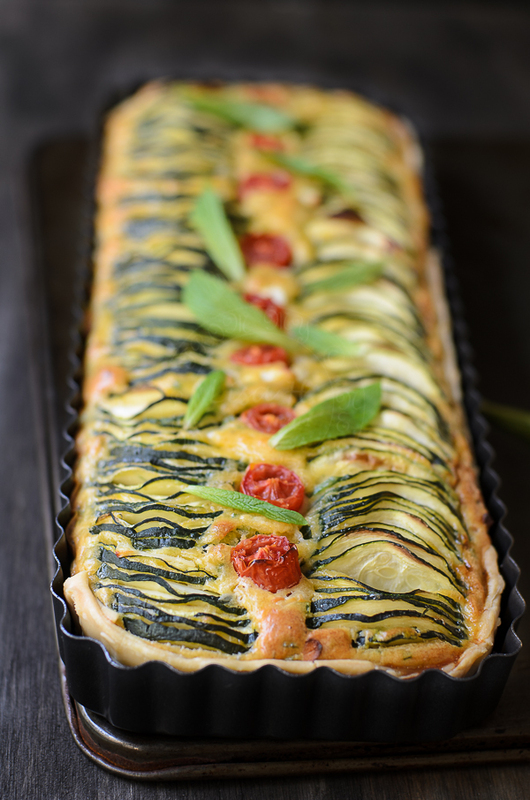 This is a fantastic quiche! I love the rectangular mould.